Rare original British Quad movie poster from Sergio Leone's A FISTFUL OF DOLLARS starring Clint Eastwood. Folded, fair condition-tears, edgewear and paper loss at top. The item "FISTFUL OF DOLLARS/ORIG. 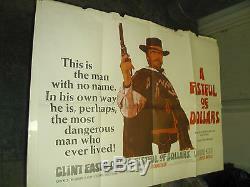 BRITISH QUAD MOVIE POSTER SERGIO LEONE &CLINT EASTWOOD" is in sale since Thursday, February 28, 2013. This item is in the category "Entertainment Memorabilia\Movie Memorabilia\Posters\Originals-International\1960-69".